Looking for affordable silver jewellery? Amarachi Silver Art Jewels In Hauz Khas Village will leave you spoilt for choice with their unique collection. 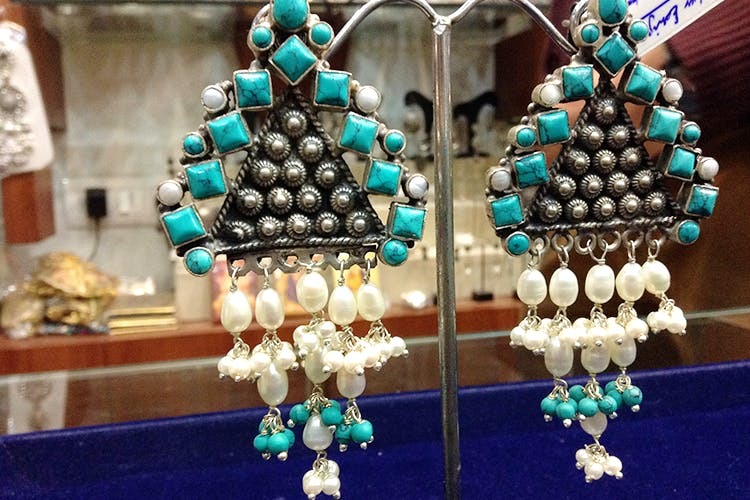 Amarachi Silver Art Jewels, a tiny place bang in the middle of Aurobindo market, is great for some last minute gifts. Be it a birthday, a goodbye gift, or to make your cranky boss happy, the earrings and rings come at an affordable price and in varied designs and sizes. The oxidised silver studs and drops are studded with beautiful stones, making them look classy. You can also go extravagant and buy the big loop earrings and elaborate heavy designer earrings. The range for silver starts at INR 600 and goes up to INR 5,000. If you're shopping for your own wedding or for a friend/relative’s wedding? This place is gold! Apart from heavy silver jewellery, you’ll also find beautifully crafted kundan and pearls and a lot of gold and diamond too.